With the accelerating pace of development and subsequent habitat destruction, the pressures on wildlife populations are greater than ever. But there is a surprisingly important and relatively simple step toward reversing this alarming trend: Everyone with access to a patch of earth can make a significant contribution to sustaining biodiversity. There is an unbreakable link between native plant species and native wildlife. Most native insects cannot, or will not, eat alien plants. When native plant species disappear, the insects disappear, thus impoverishing the food source for birds and other animals. In many parts of the world, habitat destruction has been so extensive that local wildlife populations are in crisis and may be headed toward extinction. By planting natives, everyone can provide a welcoming environment for wildlife. This doesn't need to entail a drastic overhaul of your yard or garden. The process can be gradual and can reflect both personal preferences and local sensitivities. 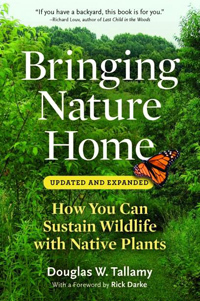 Bringing Nature Home has sparked a national conversation about the link between healthy local ecosystems and human well-being, and the new paperback edition -- with an expanded resource section and updated photos -- will help broaden the movement. By acting on Douglas Tallamy’s practical recommendations, everyone can make a difference. 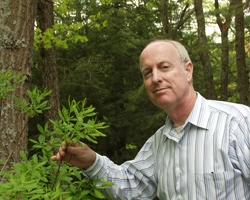 Douglas W. Tallamy is Professor and Chair of the Department of Entomology and Wildlife Ecology at the University of Delaware in Newark, Delaware. Chief among his research goals is to better understand the many ways insects interact with plants and how such interactions determine the diversity of animal communities.